Please contact our Customer Services Department regarding return and/or replacement of the Eurosteam® Next Generation Iron via our contact us page.Items ship within 48 hours of order being processed. The Eurosteam® Next Generation Iron is available for shipping across USA. Once the item leaves our warehouse, the shipping method you choose on the checkout page determines how quickly your shipped item arrives. 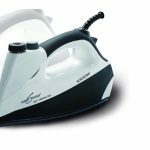 The Eurosteam Next Generation Iron is a revolutionary steam iron that is simplifying the way people iron their clothes all over USA, by making it easier and quicker. The light-weight steam iron press features a compact design and is specially crafted to be super-efficient and extremely user-friendly. 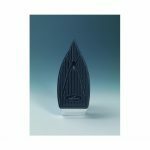 The distinguishing feature of the Eurosteam Next Generation Iron is the ability to iron all fabrics with the same setting. That means no more wasting time to adjust the iron setting each time you change the cloth, or guessing if the iron is too hot or cold. The steam iron doesn’t take much time heating up and a ready light button indicates when the steam iron press is ready. The unmatchable 1000 watts power of the steam iron projects efficient wrinkle-fighting steam that smoothens multiple fabric layers in one go, and cuts down the time you spend ironing by half. Moreover, the uniquely elongated tip of the ceramic sole plate makes ironing between buttons, belt loops or rim supremely easy. 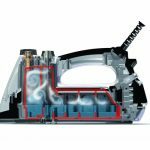 The steam iron press utilises the steam power with much greater efficiency as compared to traditional steam irons, and is built to give you quick and consistent results. 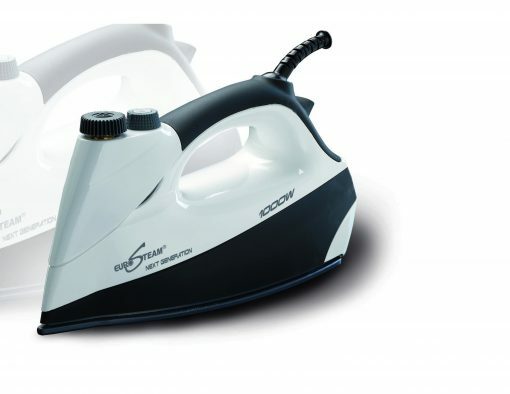 The Eurosteam Next Generation Iron is a radical solution to save time and effort while ironing your clothes, and the several unique design enhancements of the steam iron press allow for faster, quicker and better results. The steam iron press truly has no competition, and is helping countless Americans save time in doing dreary chores, using the power of steam. This product is warranted for 1 year from date of purchase against defects in materials and/or workmanship when utilized for normal household use. During this period any model 6199, upon inspection by Certified Eurosteam® Service Department, is proved defective it will be repaired or replaced at the discretion of the Certified Technician. The unit shall be returned, by the original purchaser, freight prepaid with proof of purchase date and $19.95 for return shipping/packing charges included. This warranty does not apply to any defect arising from a buyers or users misuse, negligence, failure to follow Eurosteam® instructions, use on current or voltage other than that stamped on the model 6199 or alteration or repair not authorized by Eurosteam®. Repair or disassembly by anyone other than a Certified Eurosteam® Service Technician will void the warranty. Obtain a repair authorization number (RA number) and bring in or send prepaid to the Service Center with proof of purchase date and prepaid return shipping of $19.95. Some States/Provinces do not permit the exclusion of incidental or consequential damages, so the above may not apply to you. This warranty gives you specific legal rights and you may also have other rights, which vary from State to State and Province to Province.